Type I cells, Î² cells or gonadotrophs (FSH): large oval basophilic cells with eccentric nucleus that produce FSH. 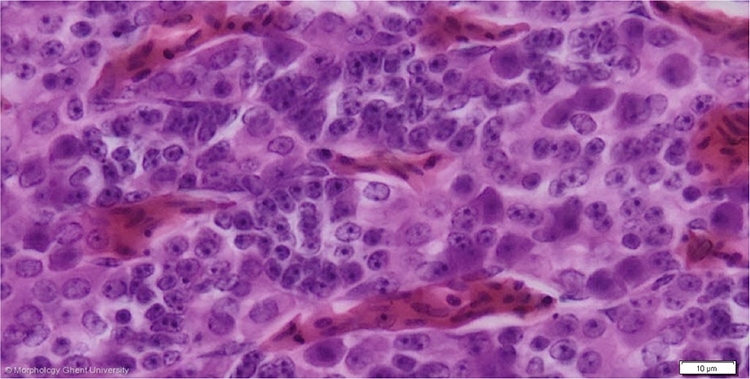 Type II cells, Î´ cells or thyrotrophs (TSH): basophilic cells with eccentric nucleus and largest cells of the hypophysis. They occur in the caudal part of the cephalic zone and are responsible for the production of TSH. Type III cells, Î³ cells or gonadotrophs (LH): small basophilic cells that produce LH. In contrast to mammals pituicytes that produce both LH and FSH are very rare in birds. Instead production of FSH and LH takes place in separate cells. Conflicting studies have variously shown LH-producing cells to be present in only the caudal lobe or in both lobes. Type IV cells, Î· cells or mammatrophs (prolactin): pale, medium sized acidophilic cells that produce prolactin. Type VI cells or chromophobes: small spherical, non-secretory cells with central nucleus that are poorly stainable with acidic or basic dyes. Chromophobes contain little or no granules. They are not organized in cords or follicles but form clusters.